Those of you that follow me on Instagram know that I love my coffee. A lot. And tea, too, for that matter. For some mysterious reason, I have never made one of the adorable coasters/mug rugs that we see out there. I've admired them, coveted them and still never actually made one. Yesterday, in an attempt to use some of the scraps in my newly organized, scrappily sorted sewing space, I decided to change that. 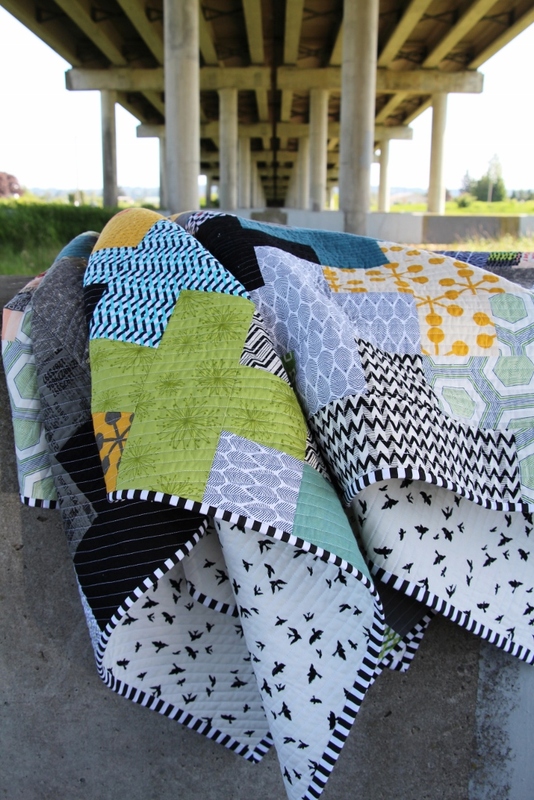 My Swoon quilt is still on the back burner, but even so, it has generated a nice little bin of mostly "Vintage Modern" scraps, by Bonnie and Camille. These scraps were not allowed to mingle. They are that special. 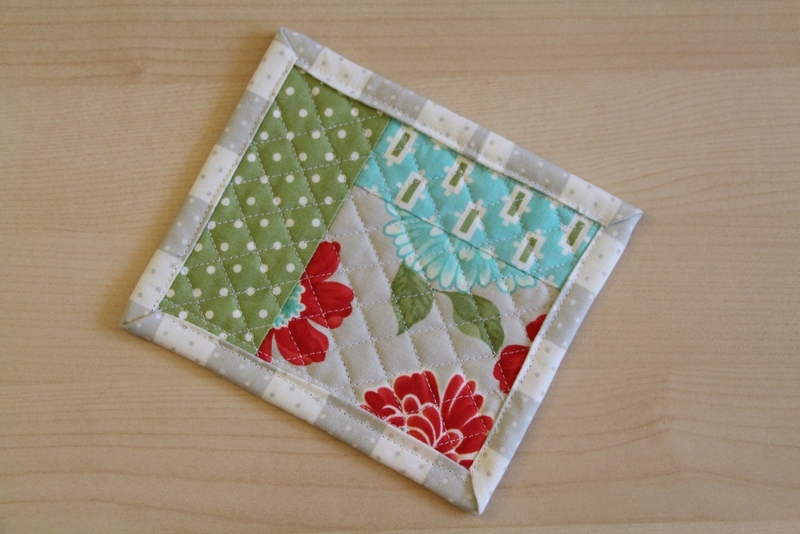 In between some secret sewing (also scrappy) I stitched up a little mug rug. 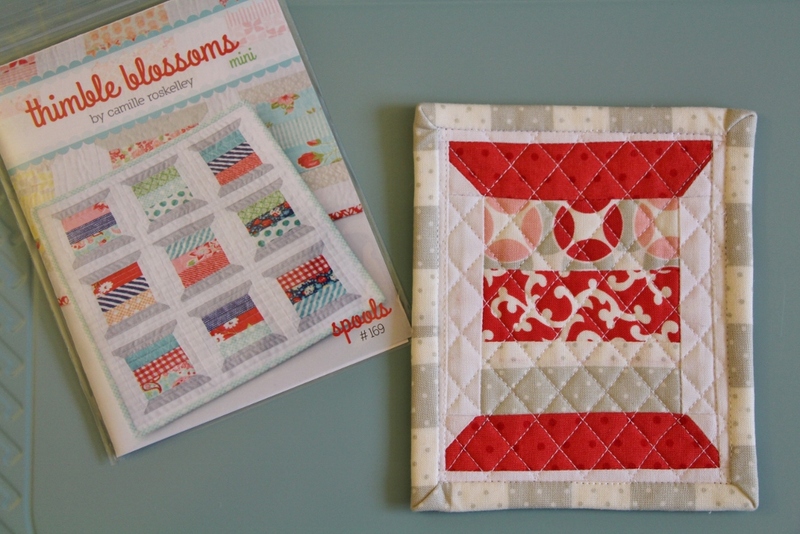 The original pattern is Spools by Camille of Thimbleblossoms. This is one of the mini-spools. I also made a micro spool, but that's for another day. 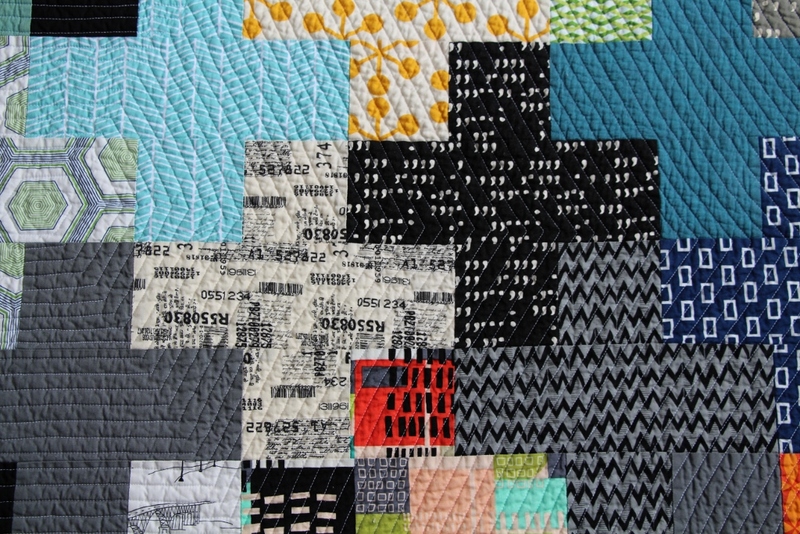 I could improve my accuracy in piecing mini blocks since any imperfection is heightened when on such a small scale. Overall though, I love it with all it's perfect little imperfections. And I really like that it's reversible. 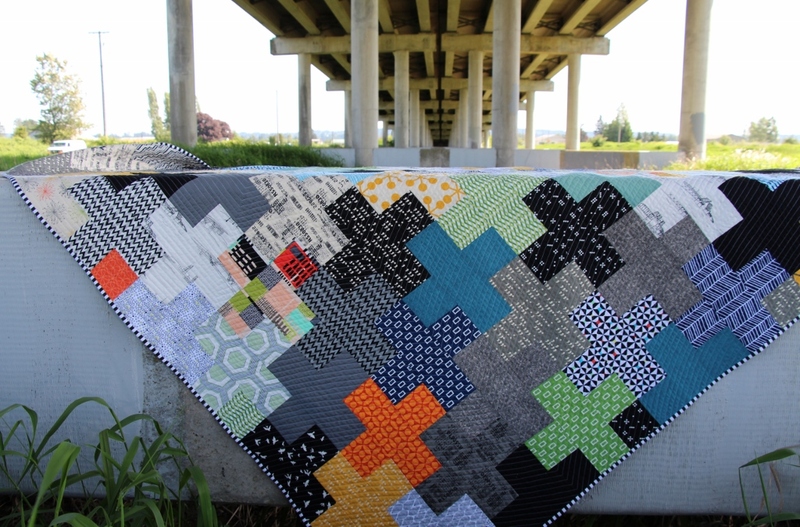 I quilted it with an all-over diamond grid. It bumps up the cute factor quite a bit. Happy Friday! (Have a wonderful weekend!) 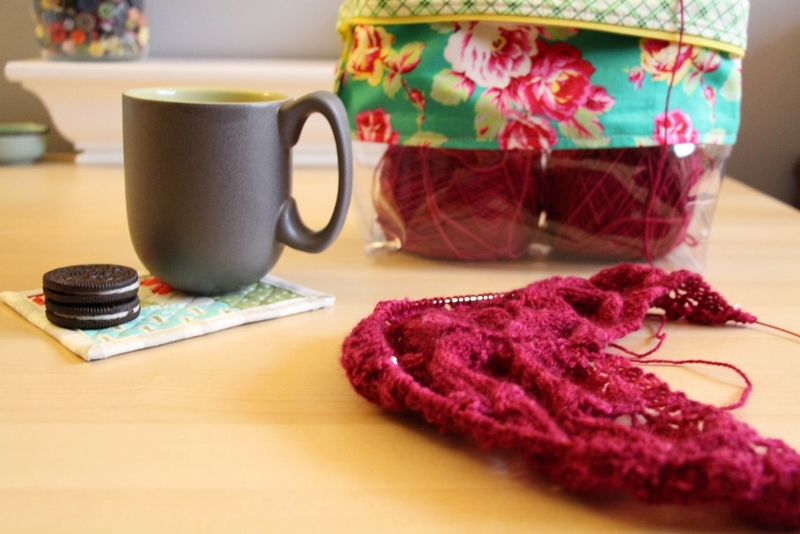 Linking up with Amanda Jean for finish it up Friday, and Needle and Thread Thursday. It's been a pretty incredible and busy week. This past weekend, my husband and I celebrated our 12th anniversary. My gift to him was his very own (first ever) quilt. For the photo shoot, I decided to go back to where we took some of our wedding pictures. It looks a bit different now, but still has a cool feel to it. 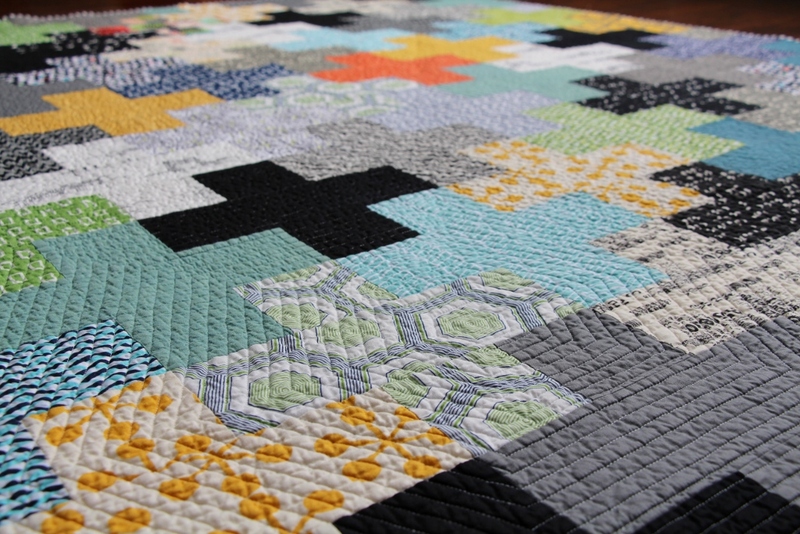 You can read more about the design process for this quilt in this post. 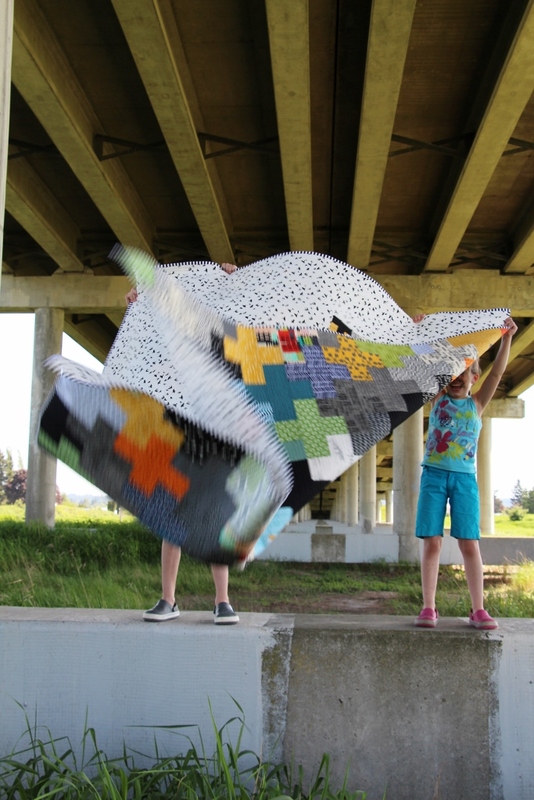 I really wanted to include my children in the making and documenting of this quilt. My oldest son was intstrumental in the basting and trimming process. And he's a pretty great photographer as well. I decided to let them help me on a fun quilt photo shoot. They had a blast. 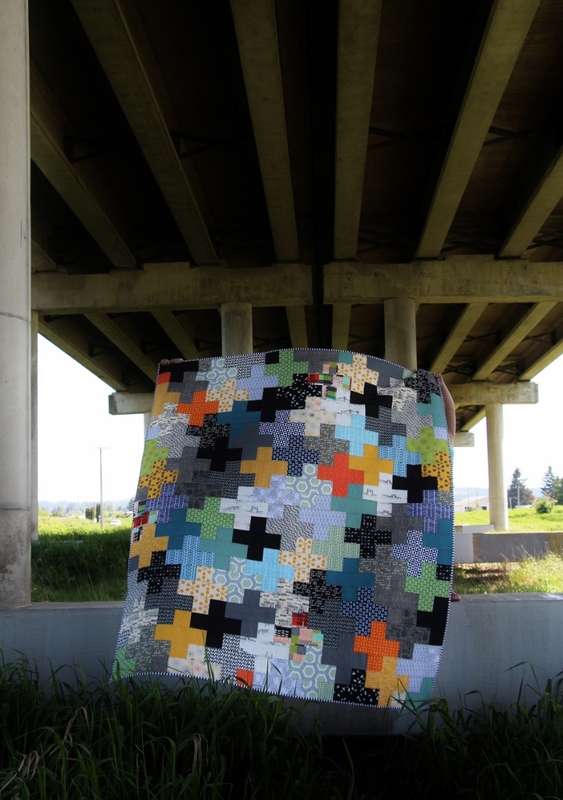 It was so windy under the overpass. For the backing, I used this lovely Waterfront Park Birds in Flight print. It is so fantastic. I made three blocks of mini plus's to break up the print and add visual interest. I quilted it using a spiraling hexagon. I used one the hexagons from this Simply Style fabric as the point of origin. 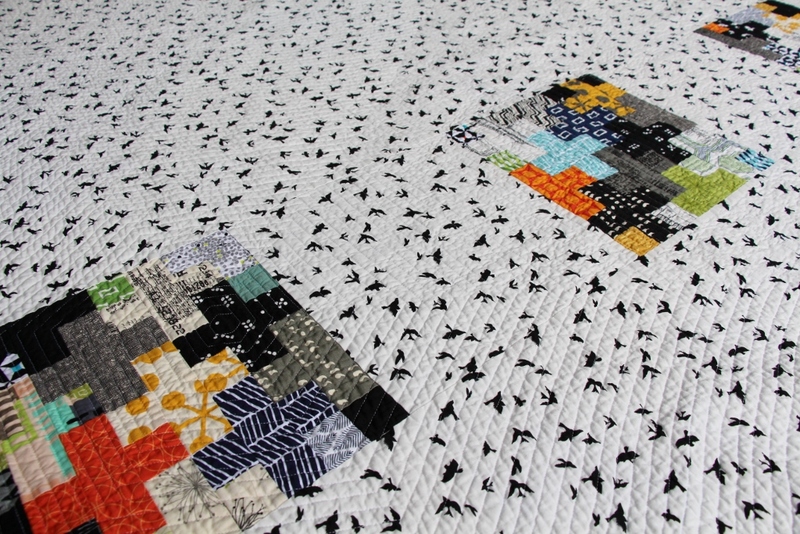 As with any spiral quilting, the beginning was a difficult process as you push and pull most of your quilt through your machine over and over. Eventually, as you make your way from the epicenter, it gets easier. It was too windy to get a really good flat picture, so I set up another shoot. For binding I used a great 1/4 inch black and white stripe. He cannot help himself if there is a quilt on the floor. 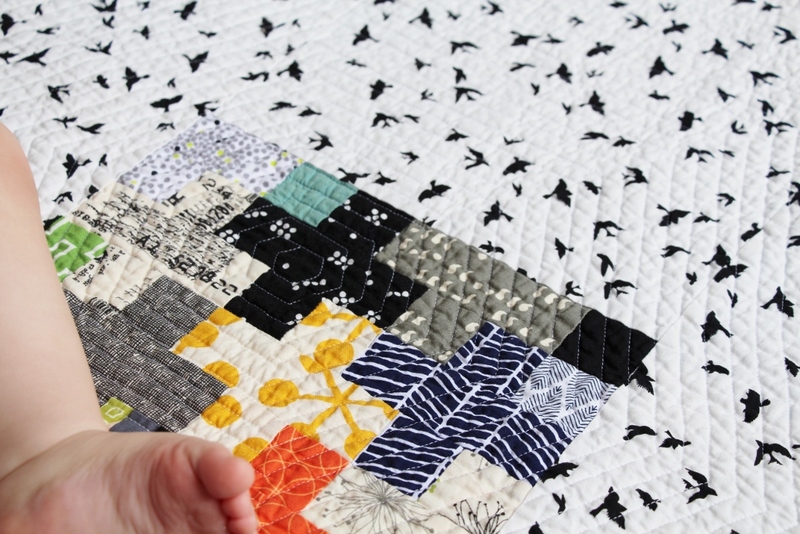 All in all, having the whole family involved in this quilt process really added to all the love that went into every single stitch. It's been washed, dried and crinkled. It kept him cool last night. This post is for all the memories of years gone by, of a growing family, and of many, many years to come. 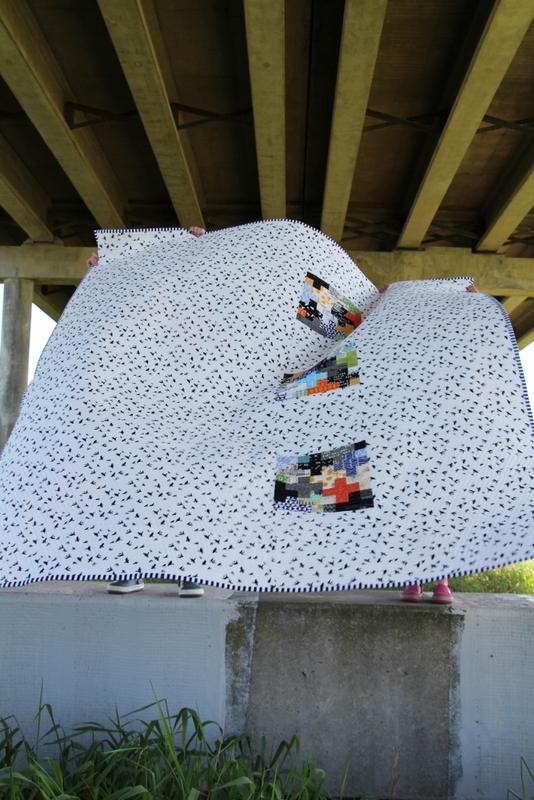 This week I'm doing something fun and entering this quilt into the Blogger's Quilt Festival. This is a first for me, and it's SO exciting. I am also linking up with Amanda Jean for finish it up Friday, Needle and Thread Thursday, and TGIFF. Last month I joined a mystery knit-along. This was totally new to me, and I thought I'd jump right in. I LOVED it. There is something so fun about not knowing what the next part of your knitting will look like. Will it be lacy? Will it be striped? Will it be both? Now that the knit-along is over, I can release the name of the pattern. It is Red Rock Canyon by Romi Designs. I knit this with two skeins of a lovely Sweet Fiber yarn in the Merino Lite weight. The colors were Sea Glass and Ever Gray. Both colors spoke to me. As the knitting grew and grew and grew, I became increasingly curious as to how it would look when I was finished and it was off my needles. It is huge (wonderfully so). I love the different parts to the design and how the stripes ripple. I'm naming my shawl Shimmer. It is a perfect fit. It is quite possibly my favorite knitted item ever. I can't wait to be able to use this on cool summer nights, after a long day in the hot sun. I have finally had the pleasure of making my hubby a quilt. This is the first handcrafted item he has ever indicated an interest in, other than the toque debacle of 2007 or so, which shall not be named. He's just not a handknit, sweater wearing kind of guy. I've been slowly collecting the fabric for this project since last fall. The stack grew and grew (yes, I have a slight problem with fabric shopping) while I searched for the right pattern. I considered designing my own, but in the end was drawn to the Giant Plus design. It's just so "manly" when done in the right fabrics. 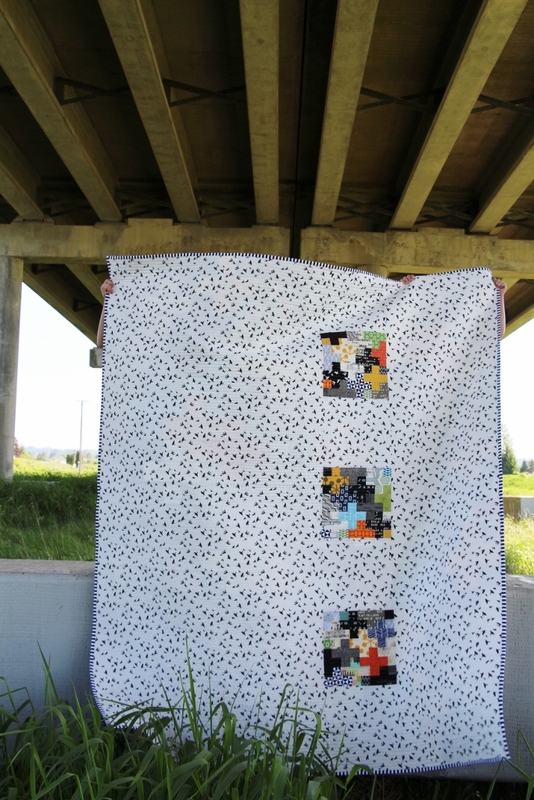 I was completely inspired by Everyday Fray's Kelsey's Manly Plus quilt. The hubby let me have creative reign with the exception of pink, purple and florals. No problem. I drafted a color/sizing sketch and went from there. In the end, I went with 24 rows of 21 units (single squares) across. Double unit: 4" x 7.5"
Triple unit: 4" x 11"
I love how the fabrics play together in terms of contrast. I'm planning on giving it to the hubby for our 12th anniversary this weekend. I have the backing planned. 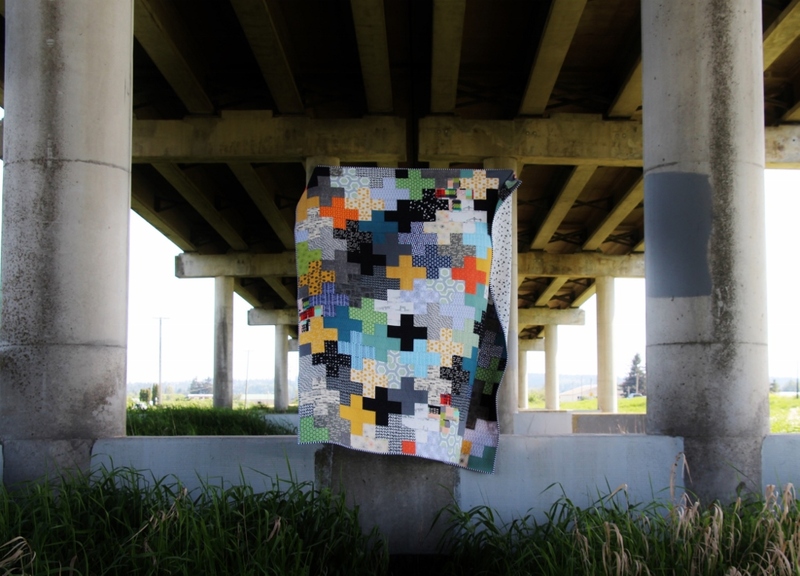 All that's left to decide is how to quilt it. And then, I've got my work cut out for me. Our local MQG was offered the chance to participate in a special challenge called the PNW (Pacific Northwest) Modern Metallic challenge. I decided to join in. The minute I received my three fat quarters, I was reminded of trees, birch in particular. I let my ideas percolate for a few weeks, sketched my inspiration and went from there. Actually starting to cut the fabric is always difficult for me. I seem to be plauged by doubts at this point - what if I can't convey my idea, what if it doesn't work, or I waste the fabric. 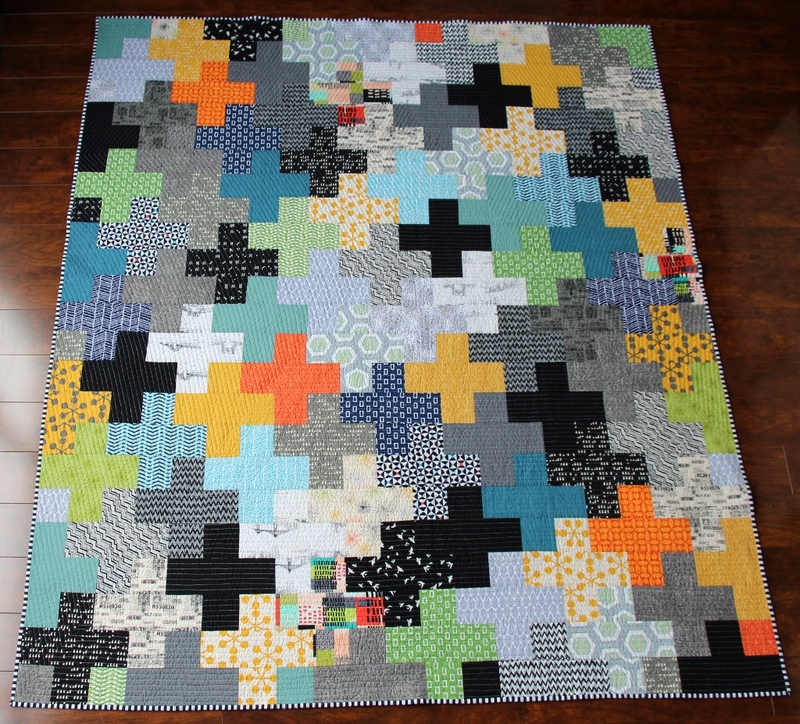 In typical me style, I started the quilt, hit a hiccup, and let it rest until the day before it was due to enter. Of course. Procrastination is apparently part of the process for me. 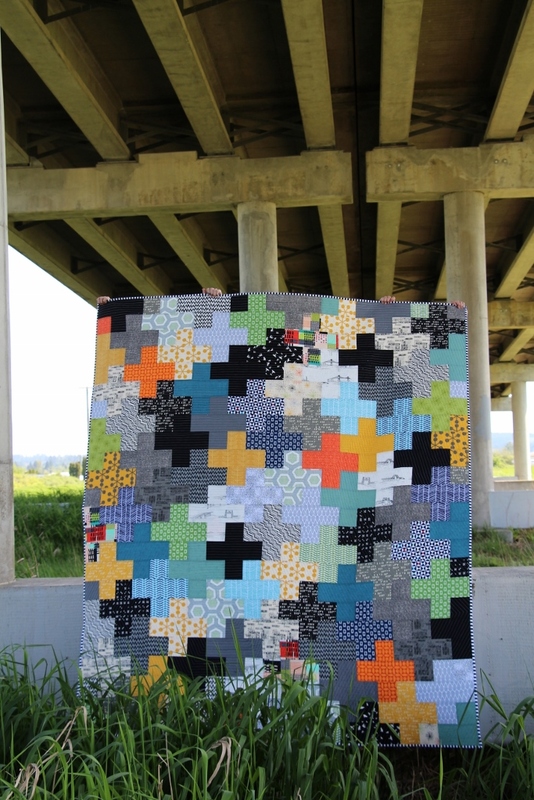 I loved playing with perspective while making this quilt. It was so fun and adds another dimension. The background fabric is a Moda grey that I have in my stash - it plays really well with the tones of the Robert Kaufman Metallics. 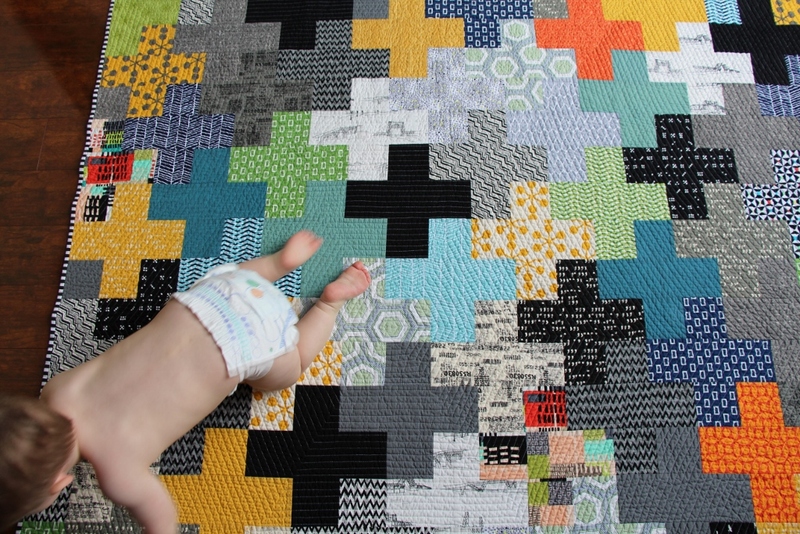 The only other fabric I used was a warm grey that my baby had recently pulled from my stash, that worked perfectly. I used an awesome silvery/pearly metallic thread to quilt it. I was terrified to use this type of thread as it was new to me but it turned out to be easy. Slow and steady does the trick. I didn't even need to change my needle type. 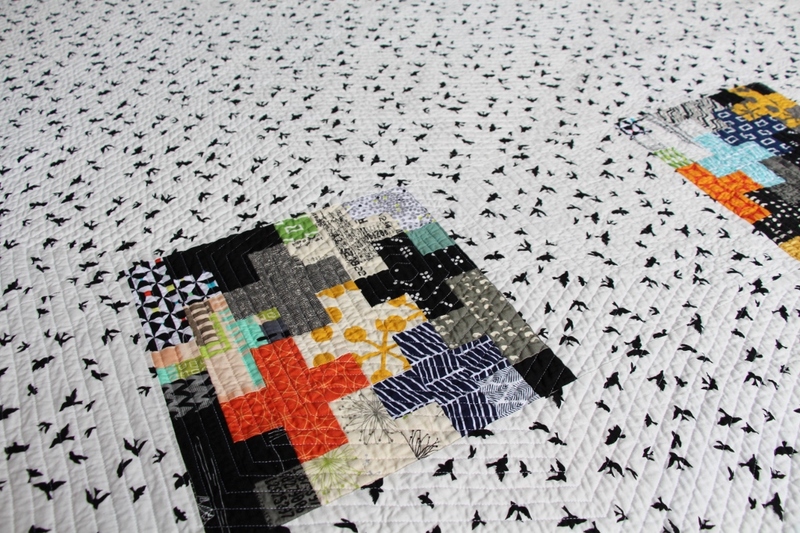 The quilting is a take on spiral quilting, but done in a square to start. I let the fabric determine the precision and spacing. 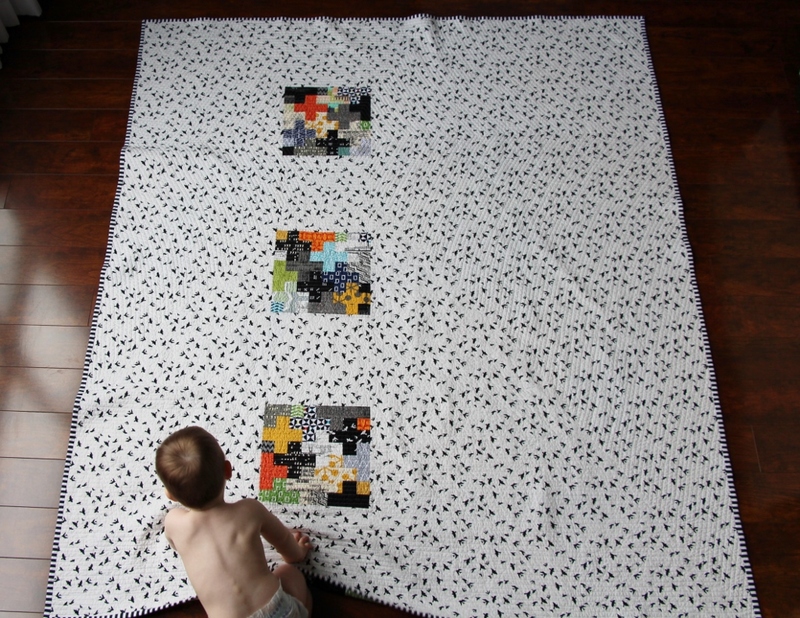 This might be my new favorite way to quilt. I've named this quilt "organic" as the entire process of making it was extremely raw and earthy. I let the fabric and thread decide what it will become, one slice, stitch, and press at a time. I didn't have a planned size, or a block design, just a feeling of shadows and trees and light. It slowly evolved into the essence, as opposed to a replica, of my inspiration. I think I'll keep it. Joining up with Amanda Jean for finish it up friday.